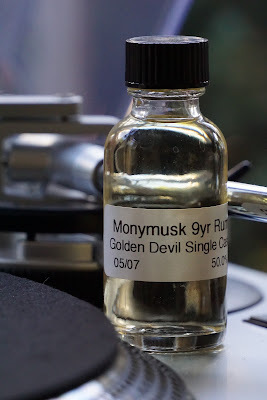 Golden Devil Monymusk 9yo Single Cask 2007 (50.0%): Monymusk is distilled in Jamaica's Clarendon distillery but because almost all of their production is contracted to supply for Diageo's Captain Morgan and Myer's brands it is pretty rare to see it released under its own name as single casks especially here in US. This single cask bottling I have a wee sample of is bottled under Golden Devil label of Hunter Laing. Golden Devil is the name Hunter Laing is using for their rum bottlings in US instead of Kill Devil brand they use in other countries. Only 274 bottles are released. Color: Almost clear with a hint of pale straw color. Thin but persistent legs. Palate: First impression is more like a young grain whisky or maybe cask matured genever. Are we really sure that it is a rum..? Very malty and grainy notes are confusing. If you really pay attention you get the molasses towards the end of the palate but is more like a burnt sugar or brown sugar note in a whisky than a rum. If you allow it to air it opens up more: Menthol mouthwash, pine needles and young alcohol. Finish: Long and sizzling at the top of your tongue. Fresh lemon juice and white pepper. Overall: Very interesting spirit... I wouldn't call it as a rum in a blind tasting. The best I could come up with would be a very young Scotch whisky with loads of rum-like notes but probably not a rum. Hard to believe that it is a molasses based spirit... I am utterly confused but I also liked it a lot. I wonder how it would taste like if it was aging in a more active cask. At the end it's not a sipper for my two cents... Maybe out of curiosity you would sip it for a couple of times but then the right way to benefit from its qualities would be to mix it with something. It would make a killer highball with coke or with a strong ginger beer... Thanks to Josh Hodas for the sample.